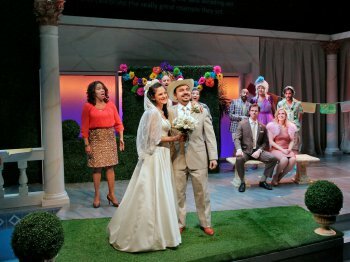 Set in contemporary Beverly Hills, the classic opera The Marriage of Figaro has been cleverly and faithfully updated as ¡Figaro! (90210) by Vid Guerrerio, though it would be perhaps best enjoyed by opera fans rather than casual theatergoers who could get restless. Virtually performed all in English with some Spanish for comic effect, ¡Figaro! (90210) is true to the art form with recitative and arias, that is sung speech and grand solos rather then integrated dialogue and songs that characterize traditional musical comedy. Supertitles are projected above the stage for anything that may be vocally indecipherable. With music by Wolfgang Amadeus Mozart and a libretto in Italian by Lorenzo Da Ponte adapted from the play by Pierre Beaumarchais, it was first performed in Vienna in 1786. The farcical drawn out plot is a fizzy concoction of class warfare, marital infidelity and mistaken identity. Palm trees in view from sliding glass doors, luxurious furnishings, columns and hedges are the hallmarks of scenic designer Steven C. Kemp’s artful set that instantly and clearly establishes the locale. In Guerrerio’s update , we are in the home of autocratic real estate tycoon Paul Conti who lives there with his aging B-level actress wife Roxanne, who is also a plastic surgery devotee. Barbara is their sullen teenaged daughter. Figaro is the wily Mexican-born handyman with dubious U.S. credentials. He is to marry Susana, Mrs. Conti’s spirited Mexican housekeeper with whom Mr. Conti is infatuated. Ms. Soon-Yi Nam, a tyrannical Korean factory owner, and Babayan, her thuggish spouse, are harassing Susana for owed payment for getting her into the country illegally. Donna is Mr. Conti’s stalwart personal assistant who has a rebellious hip-hop teenaged son Bernard. There’s also Basel, a flaming SAT tutor, and Atzuko, the wry stoner gardener. A myriad of zany complications ensue including a flag-waving rally against illegal immigrants. Everything culminates in an uproarious denouement. The cast is made up of trained opera singers with numerous credits and are delightful performers who vividly enact these archetypal roles with zest. As Figaro, the personable José Adán Pérez is impishly appealing. Samarie Alicea is slyly alluring as Susana. Wearing a power suit and with his leading man looks, Luke Scott is commanding as Mr. Conti. Marvelously singing an aria extolling cosmetic procedures is a highpoint of Raquel Suarez-Groen’s hyper-screwball comedy performance as Roxanne. Dwayne A. Washington’s rap song about Bling captures the overgrown boyishness of Bernard also known as Li’l B-Man. Emma Grimsley revels in Barbara’s disaffection to fine effect. Sahoko Sato Timpone gleefully embraces The Dragon Lady stereotype for her mirthfully steely characterization as Ms. Soon-Yi Nam. In a tacky velour tracksuit and laden with gold jewelry, Ethan Herschenfeld is a humorously menacing wise guy as Babayan. Lori Mirabal offers a well-rounded portrait of a high-powered executive assistant as Donna. Low-key and droll, David Castillo as Atzuko, the Cheech-and-Chong type gardener, manages to come close to scene stealing in his brief appearances. Clad in pink shorts and with a sweater tied around his neck, quirky Michael Kuhn effortlessly pulls focus as Basel. Candace Matthews, Kat Liu and Rogelio B. Peñaverde Jr. complete the ensemble playing various smaller multiple roles with comedic precision. 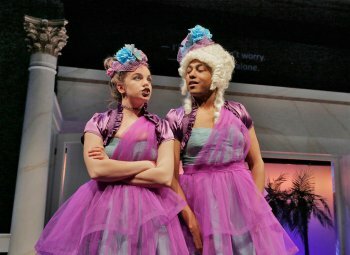 Sexting, Youtube, Big Mac, Classic Coke, booty calls, the LA Dodgers, and reality television shows are among the topical references strewn through Guerrerio’s madcap libretto. Mr. Guerrerio’s smart, condensed treatment is in the spirit of the original work, duplicating those characters and situations with modern twists. Melissa Crespo’s direction is skillfully comic with a quick pace and has a number of the performers giving suitably broad characterizations. The choreography by Stephanie Card wonderfully combines modern movement with occasional Baroque bits when a man and woman in 18th Century garb and powdered wigs cavort through the action, perhaps symbolizing the original work. Lux Haac’s costume design vibrantly displays the realistic fashions of today with flamboyant flourishes for some of the characters. The lighting design by Gina Scherr crisply showcases the actions, settings and performers. From the ravishing overture that would be familiar to almost everyone the production is aurally quite adept. This accomplished chamber orchestra consists of music director and pianist Raphael Fusco, Abigail Karr and Ezinma Ramsay on violins, Rose Hashimoto on viola, James Waldo on cello, and Yanni Burton on bass. They gloriously fill the 200-seat theater with Mozart’s music as if it were a huge opera house. Opera purists may quibble about the fine points of this version in comparison to the original, but opera fans and possibly others would find the playful ¡Figaro! (90210) very entertaining. Red Bull Theater revival of the John Ford revenge tragedy plays it safe rather than pulls out all the stops. Attempt at a parody of the Bronte Sisters and the 19th century Gothic novel is more Theater of the Absurd than the Romantic Era and far too contemporary. From the author of “Blackbird,” David Harrower’s first play turns out to be a surrealistic drama of language and word play here reset on the American frontier. From the witty author of “All in the Timing” and “Mere Mortals,” a mixed bag of new one acts: three hilarious and three that fall flat. Story of the 14th century British “mystic” generally credited with having written the first autobiography in English.